It’s by a store keeper who had recently closed their gallery. This prompted Sarah to action. Designer/Makers and independent shops and galleries need a voice. People rarely realise the considerable costs involved in keeping a shop going or exhibiting at design shows. Stand fees, power, materials, wages etc. all need to be met before any profit can be realised. Running a shop is often a labour of love and without dedication and passion, and most crucially sales, it would be another boarded up shop front. Black Friday is of course a major thing in the world of retail, and people spend like crazy in the big shops. By supporting small, independent shops you would help support the smaller businesses who showcase creativity and keep many designer/makers in business. They generate tourist traffic and make our towns and villages more interesting places to visit and spend time in. This idea doesn’t just go for bricks and mortar shops, it also goes for people who work from home and sell via, or to shops, but also those who sell direct online. Like me! And the idea isn’t literal, it doesn’t have to be a card, of course! A pot, a vase, a bag, a necklace, a scarf, a painting and so on. Supporting independent, creative and exciting shops! 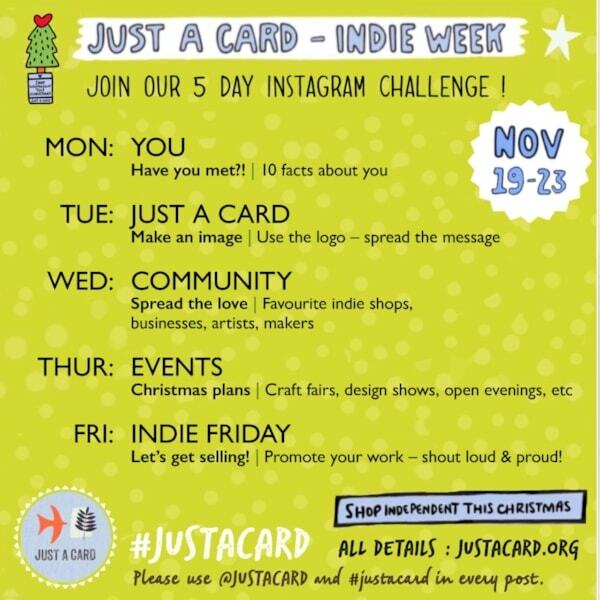 To find out more and how to take part you can find more info at the Just A Card web site. Day 1 of the Indie Week was about getting to know the small businesses so the prompt was “ME”. Along with a LOT of other design/makers I posted 10 facts about me on social media; some of which most people know, but some that most people don’t! 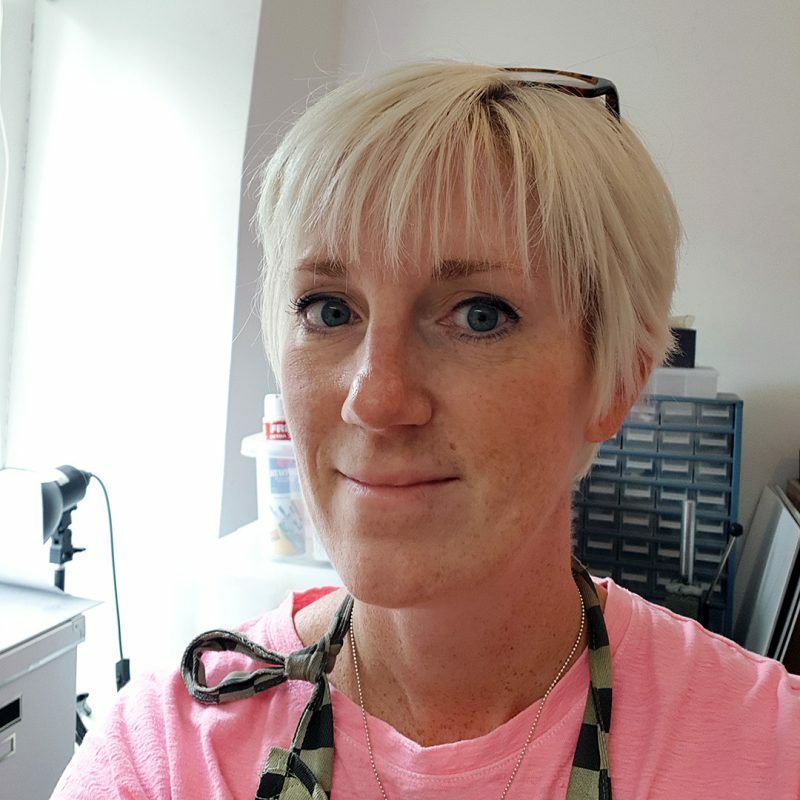 So here it is, the 10 short facts about me, one of many small independent designer/makers and business owners who would greatly appreciate your support, however small. I’m Swedish but moved to the UK over 20 years ago now. I’m over 40 but not 50. There, I say no more! I’m married and have 2 awesome children, Filip and Maja, both names with the Swedish spelling. Live in Boscastle on the rugged north coast of Cornwall, in the very south west of the UK. My grandfather was an accomplished blacksmith and his father before him. I like to think that’s where my metal interest comes from, who knows?! I started making jewellery because I couldn’t find exactly what I want, I’m a picky so and so! I get bored quickly but making jewellery is a never ending journey of new skills, techniques, tools and, of course, gemstones!! I’m a total gemstone hoarder, can’t resist anything and spend soooo much time and money on stones… it’s an addiction, I know! I take after both my mother and father. I get my love of design from my mum who was very creative, and the desire to run my own business from my dad, who was a successful businessman running his own business for his whole working life. I sing 4 part harmony in a quartet with 3 (obviously!) other fabulous ladies and we have so much fun, apart from the singing of course! I have just signed up to be part of a traditional Swedish Lucia celebration in Exeter on the 13th of December. I used to be in these throughout my childhood but haven’t been in one for over 25 years! I want to introduce my children to this tradition, as I feel a lot of my Swedish roots and traditions are getting lost living over here. So there! Follow along for the rest of the week on Instagram or Facebook. This entry was posted in About Me & Camali Design and tagged #justacard #supportsmall #smallbusiness #independent #indieshops, just a card.